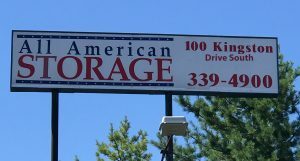 All American Storage East is located just minutes east of the Indiana University campus & immediately north of the College Mall shopping area. The benefit of storing with All American Storage is unsurpassed in Bloomington. Stop by or call to see how we can solve your storage needs. Clean units so you can move your goods right in. Individually lighted units to allow you to see your stuff. Temperature control units (2nd floor) are available to help keep fine furniture & other valuables well preserved. 24-hour gate access so you can come & go according to your schedule. 1st floor units available for ease of move-in and move-out. Service lift for 2nd floor unit accessibility. Overhead roll-up garage doors to provide easy access to the unit. 8′ high ceilings to accommodate stacking of boxes & to provide greater storage volume. On-site management for personal service. Computerized record keeping for accuracy and timely account information. Pay your bill online with our easy web-portal. Convenient office hours to serve you better. Value-priced moving supplies for one-stop shopping. Small units – 20-96 sq.ft. Medium units – 100-200 sq.ft. Large units – 400-600 sq.ft. * Not all of these features are available in every storage unit. © Copyright All American Storage (R).